The snow has begun to fall, and we’ve all got winter on our minds. Whiteface Mountain Ski Center is gearing up for what they hope to be a busy winter season, and their snowmaking skills are top-notch and ready to go! I had the opportunity to visit Whiteface Mountain before it opened for the season on Thanksgiving, and I talked with some of the staff about their snowmaking capabilities and what they had planned for the year. I have to say, their enthusiasm and excitement got me excited for ski season! They were all so friendly, knowledgeable and genuinely eager to get the season started! The high-efficiency, low-energy snow guns are in place and snowmaking at Whiteface Mountain is underway, as the mountain prepares for a great skiing and riding season this year! Whiteface Mountain opened in 1958, and has earned their spot the epitome of big mountain world-class skiing in the Adirondacks. The mountain has the greatest vertical drop in the East at 3,430 feet, and peak elevation is 4,867 feet, which includes some pretty amazing views. There are 87 trails ranging from beginner to expert trails, and the longest run comes in at 2.1 miles on the Wilmington Trail. The mountain is no stranger to Olympic athletes but sees beginner skiers and boarders regularly. Whether you’re a beginner, like me, or have spent many winters skiing the face, you’re sure to have an amazing day of skiing on the best quality snow at Whiteface. Whiteface continues to work on their green initiatives, and this year is no exception. Last year they were able to run on 100% renewable energy! Whiteface Mountain is able to pull their water directly from the Ausable River. They pump 6,000 gallons of water per minute from the river to their pump house, and from the pump house it goes through a pipeline to their hundreds of snow guns on the trials. Currently, Whiteface has between 70 and 80 snow guns running to make some serious snow for the holidays! We recently got dumped with 15-inches of fresh snow, which is a great start to the snowmaking efforts at Whiteface. Mother Nature does a good job, but there’s never enough snow! I was able to visit the pump house and see what goes on behind the scenes, which I will keep very simple! As I mentioned before, the water from the river gets pumped to the pump house and from there it's dispersed throughout the mountain through a pipepline to the snowguns. The pump house holds eight 800-horsepower compressors. These compressors convert the water to snow through air pressure (like I said, I’m keeping it simple)! Whiteface is working on using less air than they have in the past due to its high cost and lack of energy efficiency. Their goal is to reduce their footprint left on the environment. Whiteface also has 14 TechnoAlpin guns, which are all electric and very self-sufficient. These guns can be started and run from a computer in the pump house for the most part. They have an onboard compressor and filter. In total, Whiteface has hundreds of snow guns and they are able to cover an acre with a foot of snow in a matter of just a couple of hours. While I was there, they were waiting for a delivery of 12 new high-efficiency, low-energy guns to be added to their fleet for the year. They run 24 hours a day, which is expensive, but the staff thinks it’s worth it! They start with covering the highest traffic areas and spread out from there based on usage and the ability to cover it with snow. Once it has been groomed and the staff feels confident in one trail, they move to the next! I also had a chance to talk to Morgan, the snowmaking supervisor at Whiteface. He says he was hooked on this job from the start. What keeps him going? Walking down the mountain and seeing all of the snow guns doing exactly what they’re supposed to be doing, and seeing the smiling faces of all the skiers enjoying the mountain! 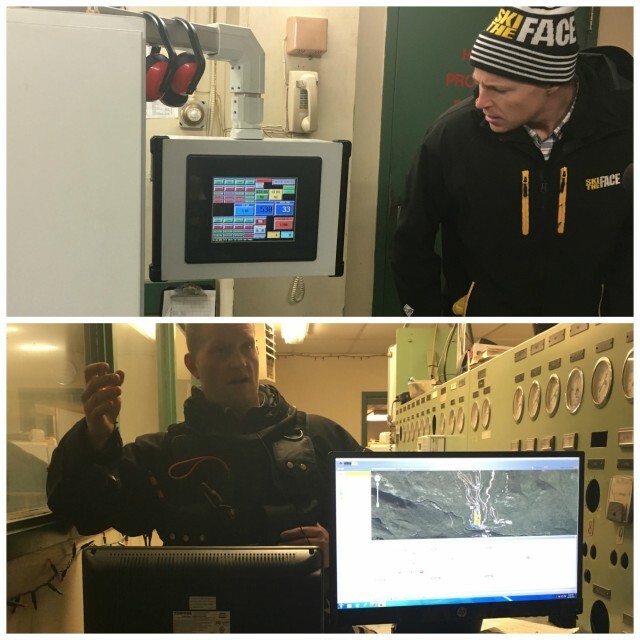 He also noted that technology in snowmaking has changed quite a bit in the last few years both in an effort to go green, as well as the quality of the snow. The quality of the snow has gotten better, and they are able to adjust their equipment according to the weather, but for the most part they can make snow that is extremely similar to that of Mother Nature’s. Their snowmaking capabilities can also extend their season by as much as a month or more! Whiteface snowmaking staff, and the rest of the staff, is working hard to have the whole mountain open by the holidays. Having a great experience at the mountain doesn't stop at snowmaking at Whiteface. They have done several other renovations and improvements that you will notice in other areas of the ski center as well. By February or March, they are also hoping that with Mother Nature’s cooperation, they will have some of the best backcountry skiing that you can find anywhere! The staff is ready for winter! Whiteface has something for every type of skier from beginner, to intermediate, to expert level. The staff wants all of you to know that they have snow — good quality — and they are ready to see you on the mountain! Plan your next winter getaway to Whiteface Mountain and see all that the Whiteface Region has to offer!